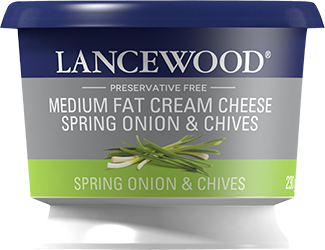 LANCEWOOD® Medium Fat Cream Cheese Spring Onion & Chives is always the favourite on a snack platter. The fresh savoury taste and smooth creamy texture also makes it a favourite with pasta and fresh vegetables. With no added preservatives, it is perfect for the whole family.